GrimmSpeed HiFlow UpPipe - Dezod Motorsports Inc - Home of the automotive performance enthusiast since 2002. 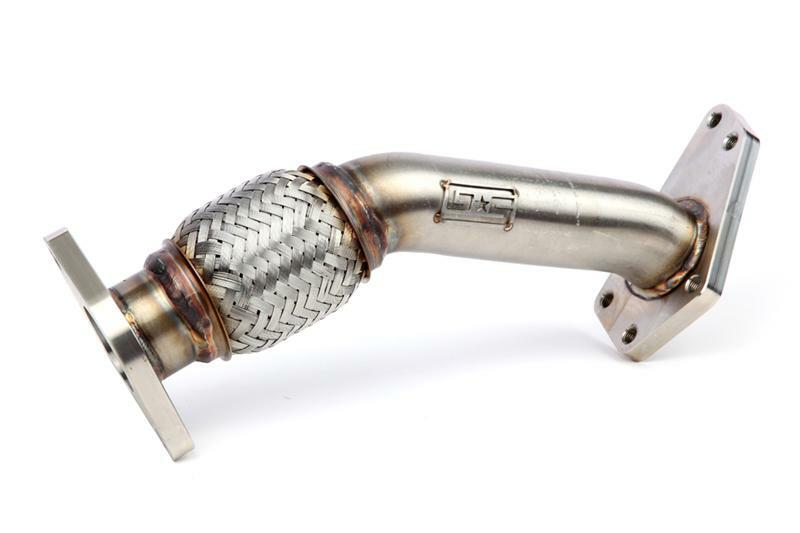 Adding an aftermarket Up Pipe is one of the first things you should do to your Subaru. Arguably one of the best $/HP ratios. Our goal was to make a premium heavy duty Up Pipe for you. We designed this Up Pipe using our in-house FARO Arm along with the latest and greatest Solidworks CAD software. This assures that we can offer you the most precise and best fitting Up Pipe on the market. In short, OEM exhaust manifold pieces are inconsistent so we used our reverse engineering hardware/software to scan countless OEM pieces to determine the range of best fitments for our aftermarket pipe. This allows us to be very confident that your flanges will be leak free and the Up Pipe will fit nicely. Our Up Pipe has been made with beefy local raw materials. The flex joint is 321 Stainless Steel w/ an Interlocking Liner and tubing is a heavy duty 14 Gauge 304 Stainless Steel(competitors use thinner 16 GA) that has been CNC Mandrel Bent and finished up with a nice brushed finish. Our flanges are made out of 1/2” 304 Stainless Steel and are fully machined on all sides(competitors typically just laser cut flanges for cost reductions). We also put a nice bevel on the edge of the flange so you don’t cut yourself. You’re welcome. The insides of our flanges are “cut-back” to allow the pipe to rest inside the flange which gives you a nice flush mating surface thus allowing optimal flow through the pipe. Heck, we started as a Porting company afterall….we take pride in exhaust flow quality through our pipes. All fabrication is completed by our Welder/Fabricator who is certified in Aerospace Welding…yeah, he knows his stuff. A bit of overkill using an Aerospace Welder you say? Well the Up Pipe is put through some very harsh environments so we wanted the best for the job. Pipe to Flange Connection – Cut-Back flange allows much smoother connection. Piping is ported flush with flange so there is no step into the pipe.